In 1971, less than a year old, Trine boards the Norwegian America Line boat “Bergensfjord” with her mother to begin a new life in Norway in a small town called Nesodden. Already on the boat, Trine shows early signs of having a knack for the entertainment business, and at 6 she declares she is going to become a “singing star”. In her childhood home at Nesodden, Trine begins her determined journey developing her voice and the skills of a performing artist. At 15, Trine becomes the singer in the duo called “The Sound of Silence”. Creating pop-songs together with keyboard player Aasgeir Knutsen. The duo enters a local talent show in Nesodden (Ungdommens Kulturmønstring). The talent show is a success for the duo, and they get 2nd place in the final. Shortly after, the duo dissolves, and Trine leaves Norway to finish her senior year at Antioch High School in California and thus receives her US diploma as an honor student. Back in Norway, Trine quickly finds her way into the circles of the music business, and begins a career as a studio singer to perform on various radio commercials and jingles. She also becomes the singer in cover band “Saturn”, something that Trine to this day refers to as the most important part of her education as a performing artist and singer. Saturn is her main source of income through 1988-1992, in addition to the radio jingles and commercials. In 1991, Trine is asked to sing the backup vocals on a track for a new hip hop band called W.I.P. (World in Peace). The band is so happy with Trine’s performance that they ask her to sing the backups on the rest of the tracks as well. When their album is complete, Trine’s contribution is so dominant that the band realizes they need to add her as a full member. The style of music represented by W.I.P. is not something Trine desires to pursue as she feels she is reduced to being an ad lib singer rather than the lead singer she sees herself as. Trine agrees to play the part of a substitute until the band can find another singer. Upon the album release of “The Songs We Write”, W.I.P. gets a radio hit with their first single, “Ghost Jam”, and is suddenly a sought after band for interviews and tv shows in Norway. The next single, a cover version of the Everly Brother’s “All I do is Dream” also makes it to the charts, and at this point Trine is discovered as a singer by other record labels. Trine is contacted by manager Steinar Fjeld, who ensures her first contract as a solo artist with EMI Records in Norway. Two years later, in November of 1993, Trine’s debut album “Finders Keepers” is finally ready for release, with first single “Just missed the train”. After all this time, Trine has lost faith in herself as well as in the album, and the night prior to the release she is torn up and in tears on the floor. The market, however, has a different opinion, and in less than two months, “Finders Keepers” has passed 50.000 copies sold in the stores. Into 1994, the album makes number one in the charts in Norway, and sales end at 200.000 copies in Norway (every fourth home has one…), and more than 400.000 copies is sold in Japan. In Japan, single “Just missed the train” tops all of 16 different charts at once. Follow up single “Stay with me baby” also becomes a radio hit and places Trine on the map of very credible singers. Trine’s over night success has taken everyone by surprise, including the artist herself. However, due to a very heavy schedule of promoting and touring with her album, Trine is not given much time to contemplate her incredible break through, and for a while her life becomes a complete whirlwind. For her debut album, Trine receives a Norwegian Grammy award for “Best New Artist” of 1993. For this year’s Grammy awards, the Norwegian Grammy awards committee have decided not to nominate Trine. Behind the scenes, there is a major tug-o-war between the members of the committee, with only one of the members, Kristian Lindeman, fighting to ensure Trine’s nomination. As the album sales continue to break new records nationally as well as internationally, the committee eventually decide an award is necessary in order to maintain their own integrity. A new Grammy award category for “Best New Artist” is established, and Trine receives her Grammy award as a big surprise in a news cast outside of the main Grammy award show. The following year, Trine is nominated to “Artist of the year” in the Norwegian Grammy awards. During this period, she breaks the collaboration with her first manager, Steinar Fjeld, and begins working with new manager, John Overgaard in Denmark. This brings her to Copenhagen where she switches record companies to work with EMI Medley, Denmark. Her new A&R/Executive Producer Poul Bruun becomes her right hand for the next few years, and together they create follow up albums, “Beneath my Skin” and “To find the Truth”. “Beneath my Skin” is released in 1996 with first single “Torn” which opens new territories for Trine as well as securing her position as an established artist in Norway and Japan. The total sales of her second album pass 300.000 copies, and Trine is nominated to “Best Female Artist” in the Norwegian Grammy awards 1996. In the springtime of 1997, Trine is invited to participate in an annual songwriter retreat in France, organized by Sting-manager Miles Copeland. More than once, the songwriter sessions at “Le Printemps de Marouatte”, or “the Castle songs” have made music history, with among others, Aerosmith’s hit song “Love in an elevator” by Mark Hudson and Steven Tyler. Trine has the honorable opportunity to work and write with legendary songwriters like Carole King, Louise Goffin, Mark Hudson, Bob Dipiero and Billy Maddox, as well as musicians and artists like Vinnie Colaiuta, Dominic Miller and Brad Roberts from the “Crash Test Dummies” to mention only a few. This experience changes the course of Trine’s plans, and she decides to temporarily move to Los Angeles, CA to pursue working with her newfound colleagues in the music business. “To find the Truth” is to a great extent produced in LA, California, where Trine spends much time between 1997-2000. The great Norwegian influence in this particular album cover, video and press pictures symbolize Trine’s passion for her childhood country, and her need to share the beauty of Norway with fans across the world. Although passing sales of 100.000 copies, the Norwegian press decides that Trine’s attempt to promote Norway internationally is not of any interest, and her career no longer impresses them. Upon finishing her promotion tour with the “To find the Truth” album, Trine takes a brake from the music business to recover from her immensely hectic years of success, and to seek inspiration for new and exciting future projects. The break from the music business lasts for five years with only a few occasional rare performances. Trine Rein moves back to live with her father in San Francisco, California where she can be incognito and continue to work with people from her network. Trine faces an all time low in her career as a professional artist, and finds herself working as a limousine driver to make ends meet. Continuing to pursue her dream as a singer and artist, she moves to Los Angeles to create more music with friends and colleagues, still stuck in the limousine business to make a living. During this time, many songs are created, and many demos recorded, however few of which have seen the light of day. Trine faces another surreal experience in her job as a limousine driver as she encounters her unknowing famous colleagues as clients in her vehicle. People like Quincy Jones, Paula Abdul, Clive Davis, and Robert Plant are all clients Trine takes care of in her job, and yet she is prevented from letting them know about her “other life” as a professional artist.. In 2004, Trine gets a break she has long awaited when theatre producer Anders Eriksen from Norway contacts her in LA to offer her a part in a new show called “80-tallet Beat for Bit” (The 80-ies, Beat by Bit). The show is performed by Torhild Sivertsen, Tom Sterri, Sturla Berg-Johansen and Trine Rein in addition to The Monroes as permanent guest artists. This will be a stepping stone towards a place in the entertainment business, and Trine resigns from her job as a limousine driver shortly after to go back to Norway. The show is a great success, and becomes Trines main source of income for the next two years in addition to opening doors for her into the music business. Her record company, EMI Records, release a greatest hits album, “The Very Best of Trine Rein”, in attempt to take part in Trine’s comeback as a live artist in Norway. In the summer of 2005, Trine creates her own summer show to be seen at Trommøy outside of Arendal. The show is called “Sommerstemning med Trine Rein”, and is a feel-good type show with elements of music, poetry and short stories. The experience helps Trine really grow as an artist and a performer, and gives her new dimension in ways to communicate with her audience. In 2006, Trine participates in a concert called “ABBA in Symphony” together with Tommy Kjörberg, Geir Rønning and Maarja-Liis from Estonia. The concert is held in Hjertnes Kulturhus in Sandefjord, and is seen by many. The following fall, the four singers Trine Rein, Marianne Antonsen, Sigrid Brennhaug and Torhild Sivertsen get together with band leader Øystein Lund-Olavsen to plan and create a brand new show called “The Ladies Night”. The show is directed by Erik Ulfsby, and played through the fall/winter season of 2006 at Edderkoppen Theatre in Oslo. The singers are not entirely happy with the way the show turned out, and feels there is a distance between their roles on stage and the expectations of their audience. Due to this friction, the girls decide to take matters into their own hands, and re-direct their show. The new premier is a great success, and the show continues through the spring and summer of 2007 in various cities around Norway. In the fall of 2008, Trine meets the love of her life, explorer, author and expert on wilderness, Lars Monsen. Monsen is an important addition to Trine’s life, giving her the support, stability and foundation she needs to begin creating a new solo album. With the exception of a Christmas tour in November/December with KOR-90 and guests, Trine Rein performs only a limited amount of live concerts due to the planning of a new album. In 2009, Trine is contacted by yet a new producer to participate in the celebration of Motown Records 50’ieth anniversary. A new show is created, and during the fall of 2009, solo artists Marianne Antonsen, Noora Noor, Knut Anders Sørum, Marvin Charles and Trine Rein performs gems from Motown Records on Edderkoppen theatre in Oslo with much success. At this point, Trine Rein stakes out a new direction for herself as a recording artist. With the firm support and motivation from her better half, Trine begins to write, record and finance her most personal solo album to date, and her first album in twelve years, “Seeds of Joy”. On September 20, 2010 “Seeds of Joy” is released in Norway, and later world wide. After all this time, Trine is extremely excited to get out on tour with her own band to present the music from her new album. At the same time, Lars and Trine get the idea they are going to create a show together, combining their two professions in music and speech into a full evening show. They call their show Vilt&Vakkert (Wild&Beautiful), and the plan is to set up this original evening show in only a few, selected venues in Norway. On Oct. 6th, 2010, they perform the opening show of Vilt&Vakkert in Årnes, a small town in the South East of Norway. The show is well received by the audience, and to no surprise, not so well received by the critics. At first, the show is only set up in 10 different venues. These are completely sold out, and Trine and Lars decide to extend their tour to visit more venues around Norway. One year later, Vilt&Vakkert is seen by some 20.000 people from Kristiansand to Alta, and is well received and recommended by many throughout the country. In Nov. 2011, a live recording of Vilt&Vakkert from Olavshallen in Trondheim is released on a DVD. Recording albums and playing live is something Trine really enjoys, and in the springtime of 2011, she begins pondering her next album. Through much encouragement from her surroundings, Trine decides to begin planning for her next album – a Christmas album! The idea of creating a Christmas album is something Trine has always dismissed due to the amount of existing Christmas albums on the market. However, after a strong, spiritual experience in a church in LA a few years earlier, Trine perceives the new urge to actually record her very own Christmas album as a calling to share the message she received. Many have asked Trine why she never sings in Norwegian, so this time Trine challenges herself, and records a mixture of English and Norwegian lyrics. Ths album is called “Julegaven” (The Christmas gift), and is released on Nov. 25th 2011. As Trine’s first Christmas album, JULEGAVEN (THE CHRISTMAS GIFT) is released, Trine sets out on her very first solo Christmas tour in Norway. She begins to work with various local children choirs in the Soul Children network, opening her tour in the local church of her new home town, Skiptvet together with wonderful Skiptvet Soul Children. Leading and conducting Skiptvet Soul Children is Wenche Pedersen Dahl, a person who later proves to become an important contact and friend of Trine in the following years. Wenche inspires and motivates Trine to continue on her quest to share the gift she received, and Trine decides to make the Christmas tour an annual tradition. In 2011, Trine works with Soul Children choirs visiting 10 different churches. 2012 is also a productive year for Trine as a recording artist. Together with her better half, Lars Monsen, and her friend, writer and producer, Øystein Lund Olafsen, she writes and records a new support song to honor the mushers in the dog mushing race, Femundløpet. The song is called “When Heroes are Made”, and is released on February 2nd, 2012. To the surprise of the writers, the melody of the song turns out to be very similar to Toto’s “Child’s Anthem”. Needless to say, this causes a few weeks of nerves and headache for the share holders, and Trine proceeds to do what she feels is the only right thing to do, – she contacts the writer of “Child’s Anthem”, David Paich in Toto to work out the issue. David turns out to be a very understanding and positive guy, and to make a long story short, Trine and David manage to work out a deal where they both end up as co-writers on “When Heroes are Made”. Trine speaks of this event as a very honorable chapter in her life as a song writer, and is eternally grateful to David Paich for meeting with her to find a good solution. Trine Rein celebrates her 20th anniversary as a recording solo artist in Norway! She wants her anniversary year to begin with the release of new music. Right after new years, Trine releases her new single, “The weight of your kiss”, written by Danish artist, producer and writer, Tobias Stenkjær. In July, Trine Rein is to perform at a festival called “Skudefestivalen” on the West-coast of Norway. This is where she runs into tenor Sveinung Hølmebakk from Nordic Tenors for the first time, and together they perform David Foster’s “The Prayer”. The more than 5000 people in the audience love their performance, and the two singers decide to create something exciting together for the following year. In September/October of 2013, the anniversary is celebrated with Trine’s very own anniversary tour. The tour is called “20 years – in the Midst of Music”, and she performs a self written multi media show in 9 different venues, covering 7 Norwegian counties with a 5 piece band and crew on the road. The tour is also entirely booked and coordinated by Trine Rein herself, with a lot of help from her PR-manager, Hilde Killingdalen. Finishing up her anniversary tour, receiving standing ovations from an undoubtedly impressed audience, Trine turns around to release her very first live album from the anniversary show. The album is called “Hit’s and Favorites” from her “20 years – in the Midst of Music”. Her new artist partner, Sveinung Hølmebakk, joins her in some of her anniversary concerts, and together they perform “The Prayer” which ends up as one of the tracks on Trine’s live album. But there is no rest for the weary. Come November, Trine begins her third Christmas tour. This time, she has booked as many as 21 concerts herself, and works with some 40 various, local choirs along the way. She covers 15 of the Norwegian counties this time, travels far, and meets many wonderful people. She claims to get energized from sharing her message in every church she visits, and promises to continue on her endeavour to spread the Christmas gift of unconditional love which she once received. In 2014, Trine Rein and her better half, Lars Monsen again create a show together. This time the show is based upon the new TV-series shown on Norwegian national tv during Christmas, “Monsen and his dogs”. This year, Trine celebrates her 20th anniversary as an international recording artist, and her repertoar is much based on her live album, “Hit’s and Favorites”. The new show is called DagsTour (“DayTour”), and to begin with the show is only set up in a couple of venues. Lars is really in the middle of the dog mushing racing season, and only has a few days to spare for shows in his busy schedule, and Trine is eager to begin the planning of her next Christmas tour. In the springtime of 2014, Trine is requested by Norwegian national broadcasting company, NRK, to participate in a brand new tv show concept. The concept is to invite amateur songwriters to compete with their own songs, chosen by experienced artists or bands to perform them live on tv, almost like a songwriter’s Idol. Trine accepts the invitation, and through the summer, she works together with producer Thomas Kongshavn to create the best version possible of the song she has chosen among the originals. Trine’s choice is the song Story of Love by Geir Arne Hansen, originally a country ballad which is produced as an up tempo country song. The song becomes popular among the viewers, who in the end vote Trine’s version of Story of Love to be the winner of NRK’s The Hit2014! For her 44th birthday, Trine’s better half, Lars Monsen, surprises her with tickets to see The ZappaUnion play live in Oslo. Trine has no idea she even likes Zappa’s music, but during this concert, she finds the inspiration to go completely new ways with her music. She calls one of her most creative colleagues, guitar virtuoso Ronni le Tekrø, to share her thoughts, and Ronni immediately catches on to the idea. Ronni insists on bringing one specific producer and writer into the equation, namely rock legend Tony Carey. With an open mind and a mission to let the creativity flow, Trine picks Tony up at the airport in Oslo for the first time in January, 2015 to begin their studio session at Ronni’s own Studio Studio Nyhagen. This collaboration proves to be one of the most creative sessions Trine has ever embarked upon, and within the first three days of collaborating, the three create all of three new songs, record and finish their first demos together – safely engineered by genius tweaker, Kjartan Hesthagen, or Chuck the Geek as they decide to call him. The three talk about collaborating live, and after several rounds on how to make it happen, Trine and Tony materialize the touring plans with Tony’s regular Norwegian backing band The Jan Holberg Project. The opening show is held on April 25th 2015 in Ibsenhuset, Norway, and it marks the beginning of a longterm collaboration between Trine, Tony and The Jan Holberg Project to come. The release of their first single How About Us also takes place on the same date, and is viewed some 50.000+ times on YouTube and Facebook in the first two days after release. 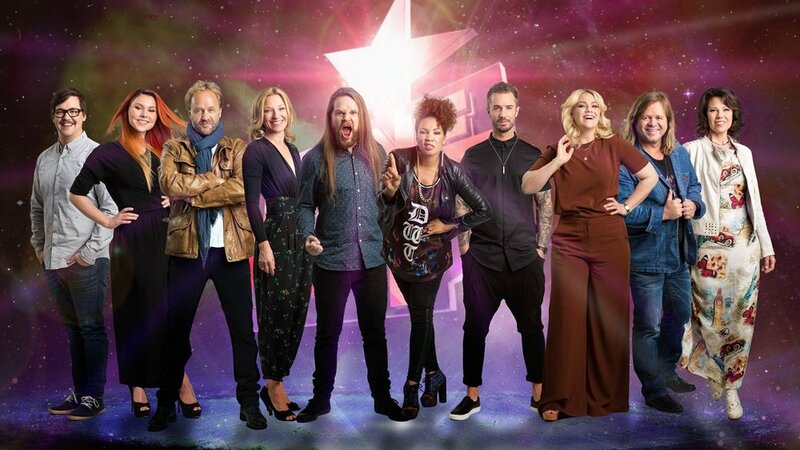 Trine Rein is headhunted to participate as one of ten contestants in NRK’s TV show Stjernekamp (The Battle of the Stars) to begin in the end of August 2015. The TV show is a fierce contest between the ten participants to compete in becoming Norway’s ultimate entertainer. They are challenged to perform in 15 various music genres every Saturday for ten weeks – at the mercy of the viewer’s votes. Trine becomes one of two finalists, and thus manage to compete in every single genre for all ten Saturdays in a row. Between Trine and artist Maria Haukaas Mittet, the viewers vote Maria to be Norway’s ultimate entertainer 2015. On November 7th, 2015, Trine Rein’s 45th birthday, and only one week after the Stjernekamp final, Trine Rein and Lars Monsen secretly tie the knot, and throw a big wedding party to everyone’s surprise, including their invited guests. All the guests are invited to believe they are going to surprise Trine on her 45th birthday. Little do they know that they are set up for the surprise of a lifetime as Trine enters the facilities in her wedding gown. According to plan, the press is left completely in the dark, and begin to speculate in whether the couple was already married in July. The couple use their social media channels to break the news to their followers, and avoid scrutiny from a tabloid media. No rest for the weary – only days after her wedding, Trine Rein turns around to rehearse the new repertoar for the upcoming christmas tour, Julenatt (Christmas night) together with colleagues Christian Ingebrigtsen (A1), Gaute Ormaasen (Norwegian Idol), Froydis Grorud (saxophone and flute virtuoso, Beat for Beat), and Trond Lien (keyboard virtuoso, maestro, Beat for Beat). For the first time in four years, Trine is not organizing her own christmas tour as she has been requested to participate in this existing production. The five colleagues create this year’s christmas concert together, and rehearse to get ready for an extended tour of 47 concerts around Norway. On November 27th, the tour begins with two concerts per night to end on December 22nd in Uranienborg church, Oslo. The tour is a great success, and practically every church is sold out weeks before their arrival. Trine is requested to participate the following year, and is happy to accept the invitation. After finishing her longest christmas tour so far, Trine turns around to embark on yet another tour before the year is over. She is invited to play all of 9 concerts on the same amount of oil rigs in the North Sea between Christmas and New Years, and is very excited to experience this different way of traveling to see new audiences on each rig. She is received warmly by the rough off shore workers, and has a memorable tour together with her keyboard player, Atle Hundsnes. Between the end of October and New Years, Trine plays some 60 concerts back to back, and 2015 turns out to be an incredibly eventful music year for the artist! 2016 starts out with single concerts around Norway playing with various musicians and bands, among others her partner in crime, Tony Carey and The Jan Holberg Project. It is a busy year for the artist with an overwhelming amount of requests for live concerts, much due to the exposure she receives in NRK’s Stjernekamp 2015. Riding on a cloud of inspiration from being challenged in all the different genres within music, Trine combines a wide spectrum of musical genres in her concerts. She visits any venue from the smaller clubs to large churches to perform and share her special and life changing story, and she is no stranger to playing concerts with set lists containing anything from gospel to rock in the same venues. The audience receives her mix of genres and story surprisingly well, further inspiring the artist to continue on her experimental endeavor in the world of music. Her collaboration with Tony Carey continues, and between playing concerts together and creating new material for her upcoming album, Trine is ready to release her second single from the forthcoming album, The Well with Don’t Say It’s Over in the beginning of September. Her next single, Hello It’s Me, is released in the beginning of November – a song about the people we love, and wish we could have spent more time with. Trine is relating to her late Grandmother, and the beautiful relationship they shared together. Through November and December 2016, Trine joins the Christmas tour production, Julenatt, for the second year in a row. Together with Christian Ingebrigtsen, Gaute Ormåsen, Frøydis Grorud and Trond Lien, they perform all of 47 Christmas concerts together around Norway before Christmas, and the concerts are a great success! Between Christmas and New Years, Trine Rein and Tony Carey are working intensively in preparing her upcoming album release and following release tour for 2017. Official release date: Jan. 27, 2017!